Bornean orangutans are utilizing logging roads for travel on a greater and greater degree, based on new research. The reason for the “new” behavior of course being the increasing levels of deforestation and habitat loss in the region. The findings of the research are something of a surprise to many researchers in the field, because while orangutans have long been known to make regular trips across the forest floor, the use of logging roads is a novel behavior (as compared to previous research anyways). The new findings are the result of research done in and around Wehea Forest — a 38,000 hectare mostly undisturbed rainforest in East Kalimantan, surrounded by logging operations. The researchers there spent 2.5 years in the area tracking/studying orangutans and clouded leopards. 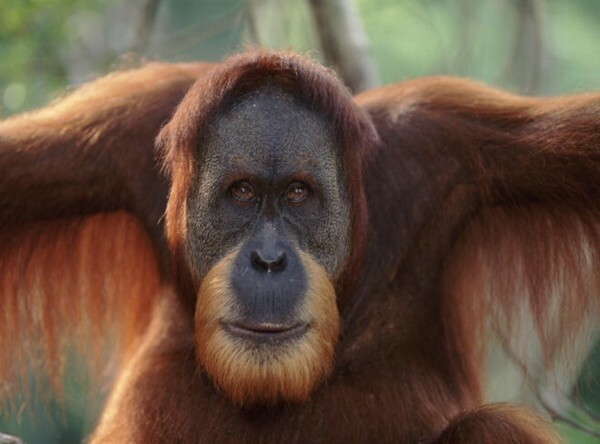 Researcher Brent Loken’s latest discovery helps to reveal that orangutans may be trying to adapt to the rapid and unprecedented loss of their Borneo habitat, which is increasingly being eroded by timber plantations, agro-forestry and mines. Researchers installed motion-triggered cameras in three regions of the Wehea Forest — one ancient and untouched, one previously logged and recovering, and one region adjacent to Wehea Forest that is now being logged. Daytime photographs of orangutan movements revealed that the apes frequently hike through pristine and regenerating forests, cleared areas, and even along deserted logging roads. Given the extreme levels of deforestation, habitat loss, and logging, in the area — there really isn’t much of a choice though is there? With industrial and economic growth in the region looking likely to continue into the foreseeable future, though, is such protection truly a possibility?